After the Three Mile Island accident, EPRI invited Dr. Moussa along with a few selected experts to help them plan a program on hydrogen safety. The burning character of the hydrogen bubble inside the reactor was discussed -- including the potential for deflagration and detonation. 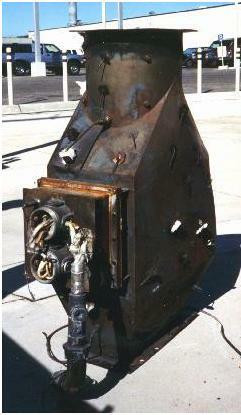 A quarter scale model of a reactor sector was selected to test fires under simulated conditions. Examination of potential for flammability in TRansUranic (TRU) Waste Drums during their processing. If the potential exists for flammable conditions, we performed deflagration calculations to determine the pressure-time history and examined its potential impact on the surrounding structure. 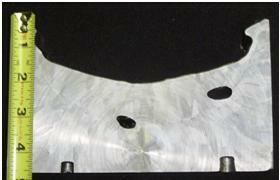 We examined the potential for hydrogen release during tantalum remelting process. 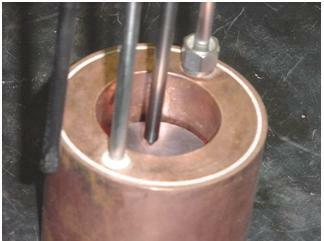 The water cooled copper jacket used to cool the molten metal may get perforated causing the molten tantalum to come in contact with water. We examined the potential for the generation of flammable conditions due to the reaction between molten tantalum and water in this scenario. BlazeTech developed an engineering model to calculate the hazards associated with the combustion/deflagration of shock sensitive chemicals. A number of common laboratory chemicals are prone to forming explosive organic peroxide upon storage for extended periods. Examples include ether, tetra hydro furan (THF), and acetaldehyde. The model calculates the overpressure, fragmentation of container and fire hazards associated with the combustion/ deflagration of lab quantity chemicals containing variable amounts of peroxides. We recently performed an analysis of the possible fire and explosion hazards resulting from breakage of a pipeline carrying flammable gas under pressure and the potential threat to the property surrounding it. The breakage may be accidental or intentional (for example, due to terrorist activity). If the pipeline breaks, it takes a finite time for the gas supply to the pipeline to be shut off. 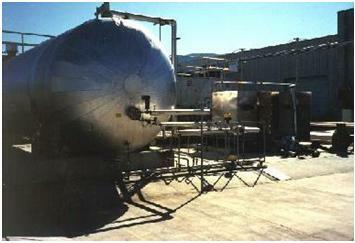 During this time, a large amount of flammable content may leak out of the pipe. Ignition of leaked flammable gas may cause property damage and collateral loss. How much natural gas will be released? Is the natural gas plume flammable? Can the natural gas plume ignite? What type of fire can result when the gas is unconfined? What are the potential catastrophic effects of a long duration fire (say 1 hour)? Can the natural gas explode? This analysis can be extended easily to predict the hazard associated with other pipelines and storage tanks carrying flammable content. For NASA, we compiled TNT yields reported for major explosions of accidentally released fuels such as propane and ethelyne oxide. To interpret a large scatter in the data, we delineated two factors: the fraction of chemical energy released in the explosion; and the fraction of released energy trans­mitted to the blast. The latter factor varied little and placed a theoretical upper limit on yield (which was consistent with the data). The former factor was accident specific and varied significantly, thus contributing to the scatter in the data. We modeled the fast deflagration of unconfined propane vapor clouds of pancake shape. We used linear acoustic theory and a Taylor-type constant-velocity flame-piston formulation to esti­mate bounds on the overpressure. We showed that the results differ significantly from those obtained with the assumption of a spherically symmetric cloud or with a standard TNT analysis. For the Coast Guard, we participated in the design of the (then) world's largest liquefied natural gas spill test fires (10,000 gallons). Both pool and vapor fires were tested. We calculated the emissive power of LNG flames based on measurements of flame shapes and sizes and spectral and total radiation fields. Also, we identified and interpreted new and salient features of the dynamics of vapor fires. For a major US transit authority, we modeled the growth of an undercar fire. 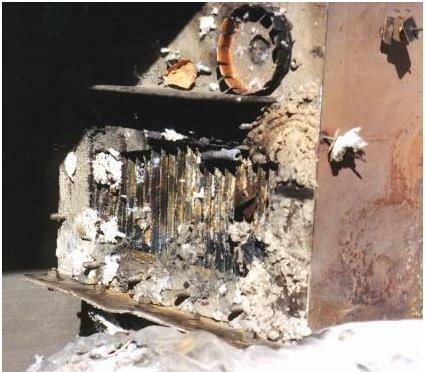 The burning rate was assumed to follow a power law involved initially the polyurethane insulation in the wall cavity, then the melamine panels, then the remaining combustible materials in the car. Two flow fields were analyzed. First, a fire-induced two-layer system with products of combustion moving away from the fire at the top layer, and fresh. air moving towards the fire at the bottom. Second, a ventilation fan-induced (forced convection) flow field consisting of a single plug flow-type gas layer which contained initially fresh air, but then, as it passed over the fire zone, it carried along the products of combustion. For each flow field, the build-up of smoke and heat was estimated as a function of time at various locations inside the tunnel--until lethal conditions were reached. We conducted a quick review of the proposed fire safety practices for the Eurotunnel train and tunnel system, and attended related hearings at the House of Lords. We suggested a number of improved safety practices, as well as an innovative method to screen cars before boarding the train to prevent leaking fuel car from entering the tunnel. We assisted the US Department of Transportation in a study to identify practical means to improve fire safety in existing and new rail transit vehicles and buses. We used fault and event tree analyses and engineering judgment to evaluate car design, operations and training. We identified practices that would prevent ignition, contain a fire, or facilitate passenger evacuation. For several petrochemical plants, we modeled a variety of accident scenarios, including the venting of gases, spills of liquids, and two-phase flow releases. These releases may be followed by the formation of pool, trench or vapor cloud fires or by fireballs, BLEVEs, and explosions. In the case of fire, we calculated the thermal radiation field around the fire to estimate the hazard zones for burn injury or wood ignition. In the case of explosion, we calculated the pressure field around the explosion point to estimate the hazard zones using damage criteria for building collapse, ear drum rupture, window breakage, etc. For a number of commercial clients, we carried out risk analysis studies covering oil/LNG/LPG operations, and shipments of hazardous materials by various transportation systems. These studies consisted of four elements. First, we identified the major types of accidents and their qualitative features. Second, we estimated the probability of these accidents using fault-tree analysis. Third, we quantified the consequences of the accidents in terms of fire, BLEVEs, explosion, dispersion and the hazard distance in each case. Forth, we developed risk profiles that integrated probability and severity and allowed us to evaluate various mitigation options.